Are you ready for snacks upon snacks upon snacks?! Cause I think it’s about that time. Hello, cheese, hummus, veggies and fruits. Here’s the deal. This week is clearly shaping up to be all about summertime food, cookout recipes and fuss free cooking. Basically everything you need to have a KILLER summer AND do all the entertaining…and eating… you please! YESS. The week before Memorial Day is all about preparation around here, eeer, well I mean preparation in the sense of breaking out all the summer recipes and just getting excited, you know? In reality, I am not prepping a dang thing at the moment. Currently I am running around like the crazy person that I am doing too many things and trying look somewhat put together…not going to lie, I don’t look put together, but then again I don’t really care either (I mean really, whose going to see me?). Come tomorrow I may try to like brush my hair or something, since I will be in New York attempting to teach two-hundred plus people about food photography…YIKES. Speaking of which, a lot of you asked why I am headed to New York. I’m going to be co-hosting an event with FeedFeed, Samsung and a few other bloggers on food photography. I’ll be making a recipe and talking through my photo process…should be very interesting. Also, you should know, I have never talked in front of a crowd before…again YIKES, but times like four! So yeah, that’s what I will be doing tomorrow. Then I’ll be hopping right back on a plane tomorrow night only to get home in the middle night and drive an hour and a half back up into the mountains. Why… because um work, and um, I am so behind, and um, HELP! Oddly, I’m not stressing out too horribly, although I should be… give me a few more hours, it’s gonna kick in. 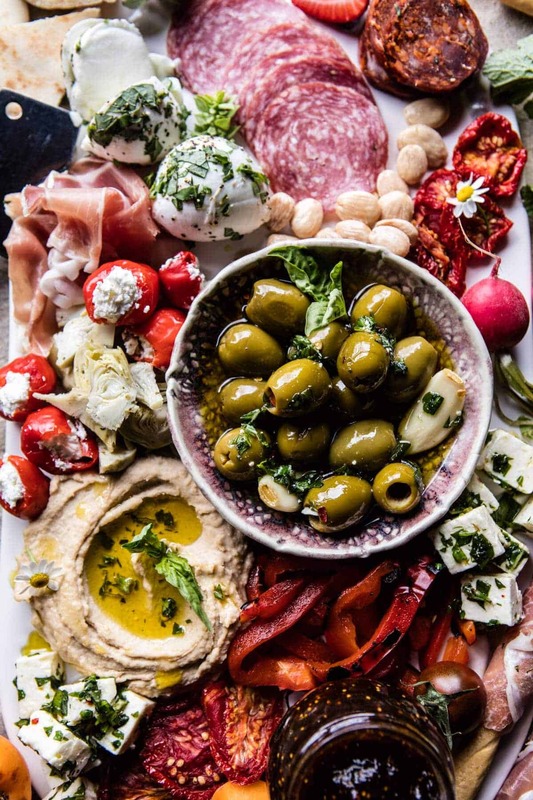 This Greek Inspired Antipasto Platter. Here’s how this works. Typically an antipasto platter is made of heavy thinly sliced Italian deli meats, veggies and mozzarella cheese. I took that idea and twisted it slightly more in the Greek direction, so that it’s now kind of a Greek meets Italian appetizers. Basically it now has EVERYTHING. See, EVERYTHING you need for an amazing platter!! Best part is that this is really simple and quick to throw together. 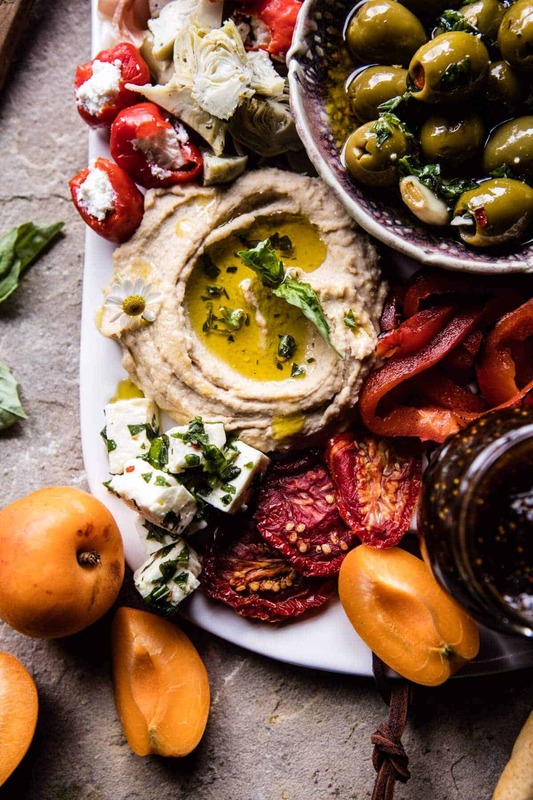 Most of the ingredients are actually store-bought or fresh and then I’m giving you my two easy recipes for marinated feta cheese and marinated olives. Don’t let the ingredient list freak you out, it’s just a mix match of ingredients. All you need to do is arrange them on a platter and call it a day. OH and the whole platter can be made in advance, covered and kept in the fridge until ready to serve. 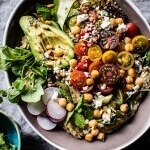 Just add the pitas, chips and bread sticks before serving and you’ll be good to go. Simple enough, right? And perfect for Memorial day! Take the sweet cherry peppers and gently stuff them with the goat cheese. Arrange all the ingredients on a large platter or wood cutting board. Drizzle a little olive oil over the hummus. Serve with assorted breads and crackers so people can mix and match their bites depending in their tastes. Add the cubed feta, herbs and crushed red pepper to an 8 ounce or larger glass jar. Pour enough olive oil over top so that the oil completely covers the feta. Screw the lid on the jar and place in the fridge for at least one hour or up to two weeks. Just crumble the feta onto whatever you wish. Add the olive oil and garlic to a small saucepan and set over medium low heat. Bring the oil to a simmer and then reduce the heat to LOW. Simmer, for 10 minutes, stirring occasionally until fragrant. Remove from the heat, stir in olives. Add crushed red pepper to taste. Can be served warm or chilled. Olives can be stored in a glass jar in the fridge for up to 1 week. Thinking major YESES all around here. Bring on the snacks. ? Roasted Red Pepper Meze Platter. 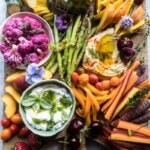 Farmers Market Pickled Crudité Platter. Being Portuguese, I am a huge fan of appetizers of all sorts. We live on these, we call it “petiscos” and ther eis a verb for it, for the act of eating these, “petiscar”. I always have a Friday or Saturday dinner once in a while where all we eat are appetizers, no main courses are allowed, and it is so good and refreshing and easy going, it’s the sort of thing that seems to bring about good conversations at the table, and a joy on being together, my son particularly loves those dinners! That sounds amazing! I think I’m gonna try that, & i think my kids would love it! Platter looks amazing Tieghan… I’m on it guys! I love dishes like this – they’re so good. All the mixtures of flavours and the fact that you can dip in. It’s such a sociable meal. Have fun in New York, some of my favourite bloggers are going to be there and it sounds like a fantastic event. Squisito!!!!! And lets call it Mediterranean platter since it has the combined flavor of Italy and Greece. This is my type of antipasto and appetizer. Hubby and I would be planted right next to that platter. I wish I could be there at your food photography speech. I love your style and it’s always great to know how you form your story. I’m looking forward to hearing your New York adventure. I know you’ll be great!! Thanks Marisa, i’m so excited I’m in New York now! Its so great to hear that you like my style! (: And i’m really happy you enjoyed the antipasto!! YAY!! Haha! So happy you like it Christine! Thank you! Beautiful and delicious antipasto! Full of our favorite foods! 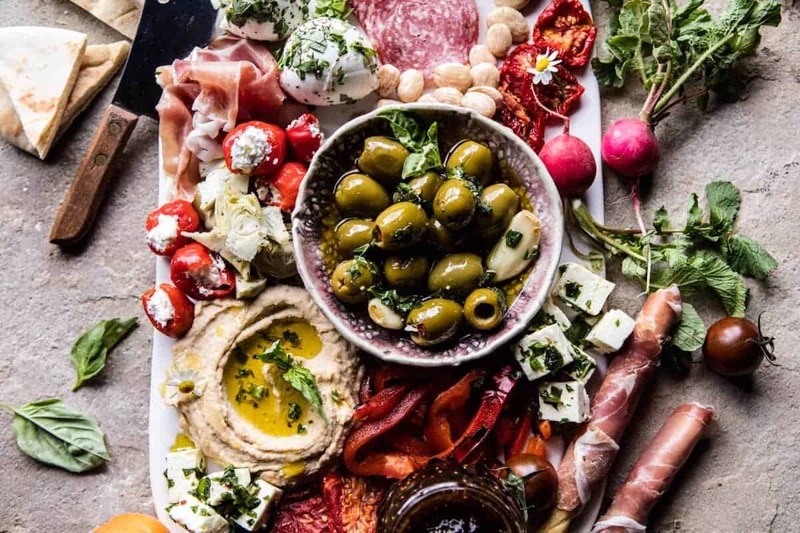 We eat a lot of those platters in Italy (minus the hummus 😉 ). Congratulations on your adventure in New York, wish I was there to listen to you! Thank you!! So happy you like it!! I’m in New York now!! So exciting! good luck tomorrow! i’m sure you’re gonna kill it (: your recipes always make my mouth water (um marinated goodies?! yes!). Best of luck in New York Tieghan!! You’ll be talking to hundreds, I’ll be making this platter. Gorgeous. Haha! Thanks Debs! Hope you love it! You’re gonna be AMAZING in NY, Tieghan. I’ll be sending you all my best. Wish I could be there!! Can’t wait to hear about it. Thanks Todd! So nice of you! I’m in New York now!! So exciting! Oh and so happy you liked this dish!!! This is my go-to on Friday nights after a long week at work- a glass of wine, the dog & cat snuggled up and Netflix or Redbox’d movie = heaven! A great trick I recently learned: if you’re serving on marble or stone, put it in the freezer for a couple of hours first. Keeps everything fresh! I love that this is your go to!! Sounds like a cozy friday night ! Yum! 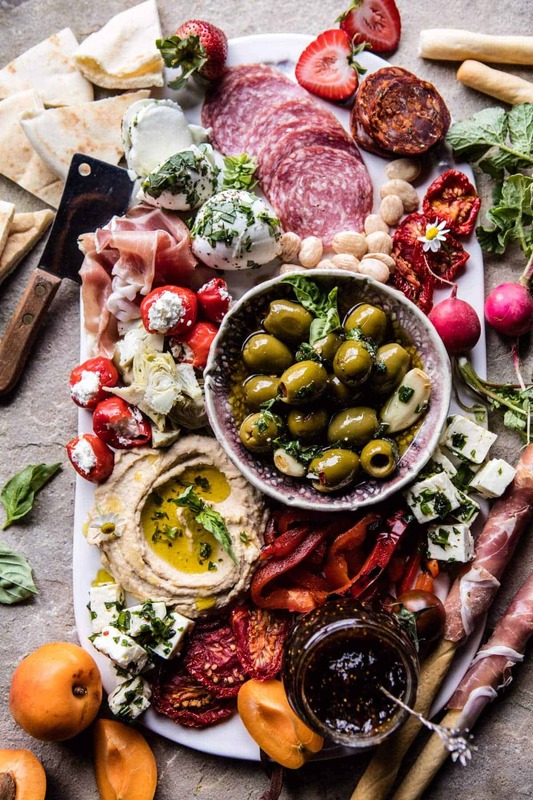 I love a great antipasto platter. Thanks Kari!! So happy you liked it! 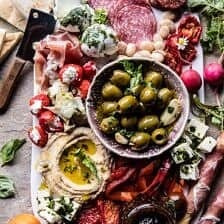 Antipasto platters are our favourite and lately we have been eating them almost every day instead of a dinner (we soo love them)! Yours looks amazing! Would love to be in NY and listen to you! Good luck! They’re so good!! Thanks Julia!! Its pretty fun here in NY! Will keep posted soon!! These pictures are wonderful. You are a pro and will do great. But I think if you go that far you should spend more then one day. There will always be work to do. What a totally gorgeous platter Tieghan! Perfect for summer get togethers! So, when I was a kid, we were at an Italian restaurant and I saw “antipasto” and asked my parents what the restaurant had against pasta. True story. Hahahaha! Thats so awesome!! I probably would have though the same thing when I was younger! Thanks Brian! GOOD LUCK talking in front of all those people… you’ll be great!! Your photos are totally gorgeous… you have nothing to worry about. Oh, and PS – I’ll totally be making this platter this summer. 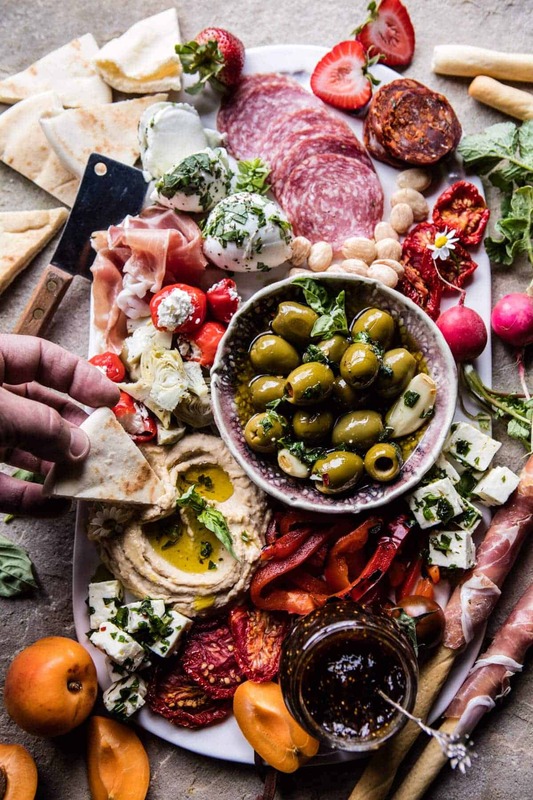 You have the most beautiful pictures on your site, but these antipasto ones might just take the cake! Again, you make the most beautiful platters! And you will KILL you lecture–I promise! Thank you so much Cassie! I love hearing words of encouragement!! If you get a chance to try this platter, I hope you enjoy!! This looks amazing! What are those seeds/nuts (?) near the salami in the upper right corner? This my new favourite blog! WOW! Such amazing food photography. Absolutely adore this antipasto! Thank you so much, I hope you enjoy the recipes! This looks so amazing! Antipasto is just the best! Beautiful! Contrast of colors on your platter plus variety of shapes…not only show your artistic talents but you good taste. Well done! I will enjoy your spin, this I know for sure. Thank you so much Catherine! So happy you enjoyed this! ? Awh, thanks so much Lisa! Nobody here in Greece eats like this. Looks amazing! Being half Greek I make something similar! Also thank you for calling it Greek!! 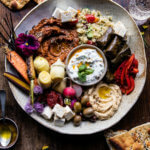 I feel like all too often I see recipes that are clearly Greek-labeled Mediterranean. Not sure why-but thank you! One thing though-I’ve been to Greece four times and have half my family from there, I’ve never seen hummus in Greece! I think in the US for some reason Greek food is very often linked with middle eastern. But you really do not see this reflected in Greece. ( aside from things like baklava etc which are eaten across the Middle East-I’ve seen people say the Turkish occupation brought such things to Greece-but I’ve also heard that those types of desserts spread from Greece during the time of Alexander the Great. The facts are most likely lost to history) thank you so much! 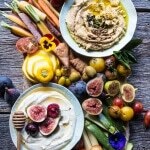 Keep up the beautiful recipes and photography! Hi Maria! I am so glad you like this platter! It is funny that you have never seen it in Greece.. I think the US does associate it with Greece. Anyway, I hope you try this out and love it! Thank you! 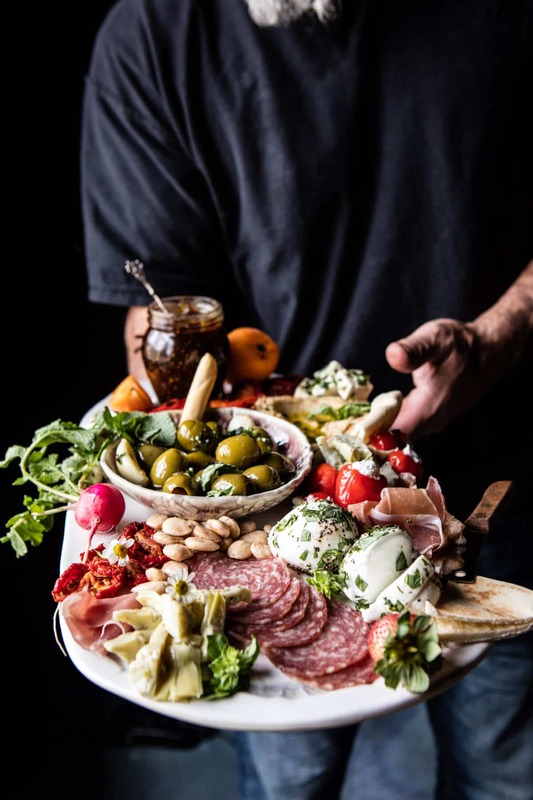 Absolutely beautiful photography (I should know my husband is a professional photographer for the NFL for over 25yrs), we love antipasto & chacuterie so together … AMAZING!! Your recipes were THE BEST … I made this for my daughter-in-laws to be’s bridal shower & it was a major hit, so thank you thank you!!! Wow that is so cool!! And thank you so much, Terrie! I am so glad you like my recipes and they have been turing out amazing for you!